Yes! Finally! We (I and whoever the hell else I forced to read this) made it through this Godforsaken tournament. Well, almost. The field has been whittled down to the Final Four. Three 10+ bug movies and a “Who did you sleep with to get here” 7-bugger from the DC Quadrant. And then after this, I can go back to updating my website with news about my pregnant wife, storytelling hijinks and bad sports metaphors. 7-bug Finalist: There were some higher-rated movies in this thing. At least 4 of them at an 8.5 or above. But they all found themselves duking it out on the bottom half of the bracket. Monster (9) squeaked out one over Crazy, Stupid, Love. 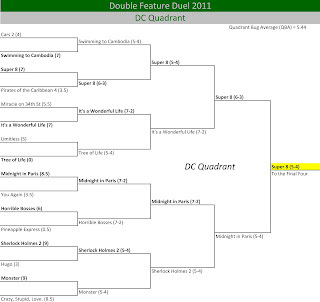 (8.5) to barely get beaten by Sherlock Holmes 2 (9), who eventually lost to Midnight in Paris (8.5). By the time they were done beating on each other, they must have been too tired to compete with Super 8 (7). Oscar Nominees: This is the time of the year I typically look to watch the Oscar Best Picture nominees. 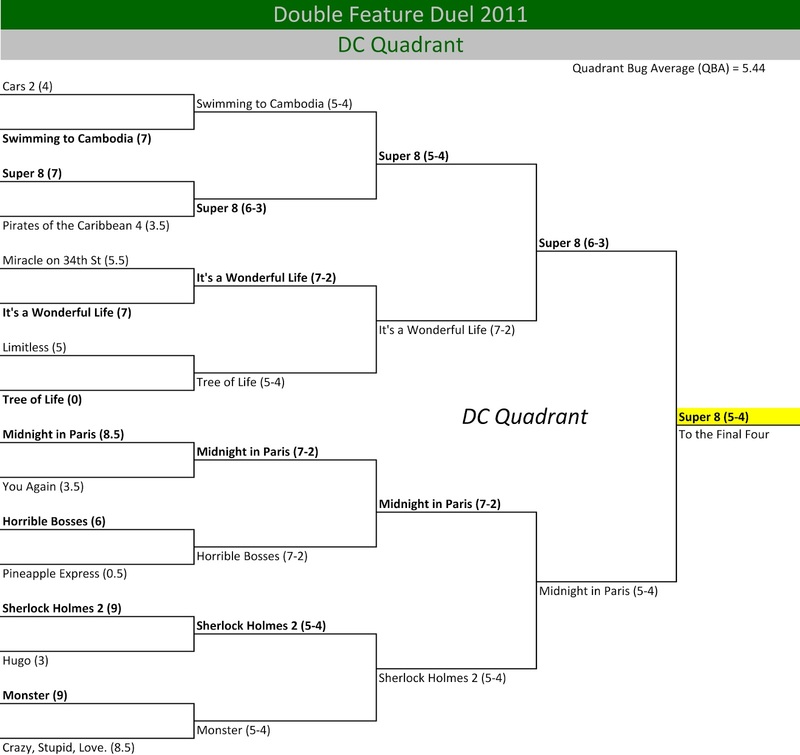 I saw three of them before the tournament was over, and though one of them made it to the finals of the DC Quadrant (Midnight in Paris), the other two were embarrassingly horrible (Tree of Life and Hugo). This does not bode well for the rest of the field. Biggest Upset Ever: A 0-bug movie beat a 5-bug movie. That’s ridiculous. A lot of the points were given to Tree of Life just by default, but if I was Limitless, I may adjust my game plan for the next tournament. And that’s it for now. Stay tuned for the Final Four and the conclusion of the biggest waste of my time in the last 9 months (purely a coincidence).